This original posting below I had saved and never got to post from the 29th July 2010. The reason for my posting it now is that today (31st Oct 2010) I counted several large bean pods. So despite the delay in planting and the amazingly warm September and October – we still managed to have some chilly nights and these are what probably got us through with what looks to being a modest broad bean harvest. The crimson flowered broad beans are still flowering and seem to be a little late in setting any pods. It still remains to be seen how they handle it. It seems the winter rains are here. Clouds are sailing across the land dropping rain in sheets over the Great Southern. 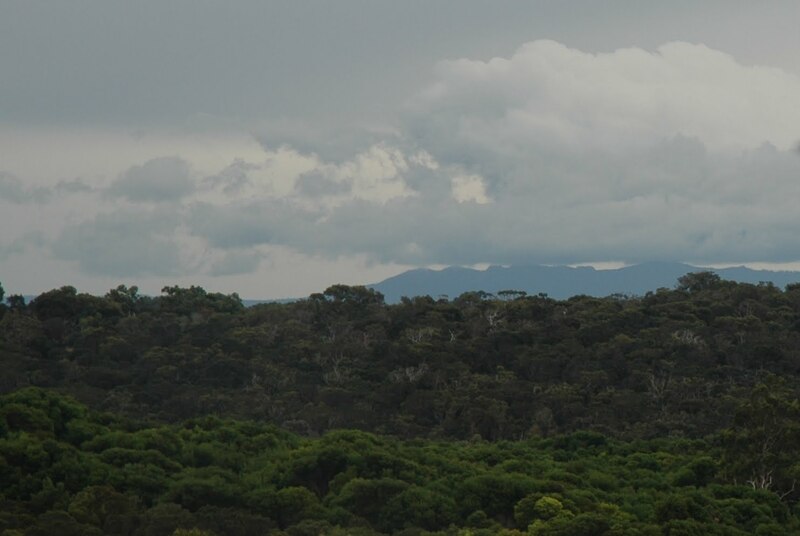 The photo above is taken from the back deck looking north to the Porongurup Range across Yakamia valley. After the warmer days and chilly nights I have deliberated about planting out broad beans this year and although having planted a small patch earlier around April I have only just planted a proper crop out over the last few days. I know they need a good cold spell while flowering to set a crop and I reckon they will get it later this year. Time will tell. I am also trying a crop of red flowering broad beans. I bought a small bag of seeds from a dear lady selling organic seeds at the little farmers market in Nannup back in Feburary. I also soaked them before planting and they seemed to plump up nicely. Very good looking seeds. The sort I figure Jack would have had for his beanstalk.